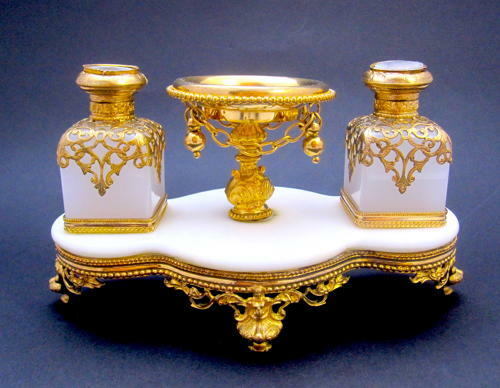 A Beautiful Palais Royal Perfume Set Comprising of 2 White Opaline Glass Scent Bottles, Each with Miniatures of Paris and Dore Bronze Mounts. The Fine Miniatures of Paris Depict The Pantheon, Paris and Notre Dame, Paris. The Large Central Dish is Finely Decorated with a Large Panel Depicting La Madeleline,Paris and Mounted with a Dore Bronze Chain and Baubaules. The Base is Marble and Has Fine Dore Bronze Mounts Intricately Sculpted with Leaves and Sits on 4 Feet Decorated with Classical Figures. RARE to Find a Complete Set and in Excellent Condition.